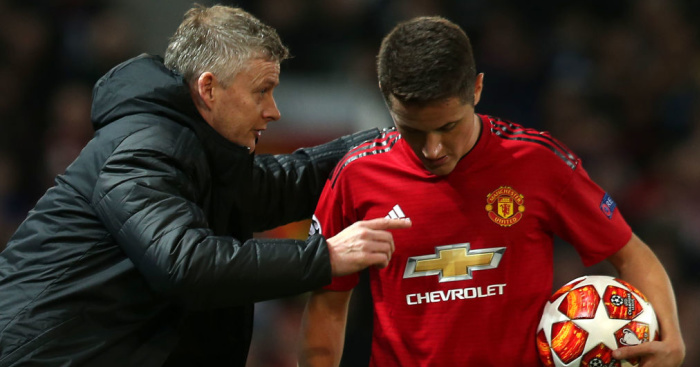 Herrera , 29, is in his fifth season with the Red Devils but is set to leave Old Trafford on a free transfer when his contract expires this summer. The Spaniard, who joined Untied from Athletic Bilbao in 2014, has been strongly linked with a move to Paris Saint-Germain and indicated that he his no closer to extending his stay with the Premier League club. When asked about his future, Herrera told Spanish publication ABC : “It’s true that I only have two months on my contract left, and today, Manchester [United] and I aren’t thinking the same and there is no renewal agreement, but my duty is to keep listening to United. Herrera is not the only midfielder in Ole Gunnar Solskjaer's side to be linked with a move abroad, with Paul Pogba's future in England increasingly uncertain. The France World Cup winner is thought to be a target for Real Madrid , but Herrera hopes his team-mate stays in Manchester. “Pogba would be a great addition for Madrid and for any team in the universe, but I hope he remains at United," he said. Herrera's comments came ahead of the first leg of Man Utd's Champions League quarter-final against Barcelona . Solskjaer's side welcome the Spanish champions to Old Trafford on Wednesday as the three-time winners attempt to reach the semi-finals of the competition for the first time since 2011. United produced a stunning second-leg comeback against PSG to advance to the Last eight while two goals from Lionel Messi safely saw the Spanish champions past Lyon. Herrera recognised that the La Liga club will enter the tie as favourites, highlighting the Argentina striker as a big reason. He said: “It is a very difficult team with few weaknesses, which also has Messi.